Table sugar is made up of high-fructose corn syrup and fructose that triggers your liver to store fat more efficiently. As your sugar intake increases fat build-up in the liver also increases, leading to fatty liver disease, diabetes, and weight gain. Blood pressure (BP) gets affected from high sugar intake. 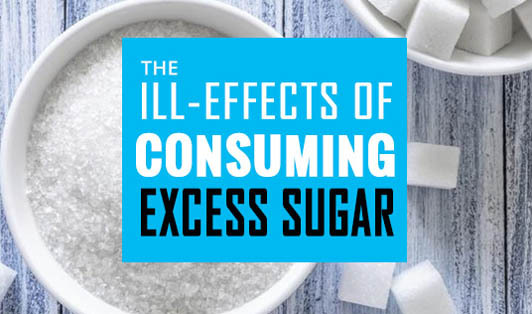 Excess sugar causes an insulin spike in the bloodstream, which takes its toll on the arteries. This causes inflammation of arterial walls that puts one on the path to high blood pressure, ultimately increasing the likelihood of a stroke or heart attack in the future. A high-fat and high-carbohydrate diet (eventually gives way to a sugar spike) leads to type-3 diabetes (a title that has been proposed for Alzheimer's disease which results from resistance to insulin in the brain) and increases the chances of being affected by Alzheimer's disease. Too much of sugar intake can raise the odds of becoming a junk food addict. Sugar hijacks brain chemistry and puts one on the pathway to addiction, making it hard to cut back. Many researchers claim that sugar can make you very lazy. Sugar wreaks havoc on the body’s sleep cycle. Foods high in sugar content will lead to mild fatigue but also simultaneously trigger the release of serotonin, the sleep regulator. So while you do feel like lying down for a bit, you won’t really be able to fall asleep. Sugar in the bloodstream attaches to proteins and leads to glycation end products, or AGEs. These unwanted invaders attack nearby proteins, including protein fibers in collagen and elastin eventually damaging them. This leads to wrinkles and saggy skin. If you are looking to cut back on sugar and are finding it difficult, choose sugar substitutes instead. Try low-calorie recipes and switch to brown sugar. In the long run, limiting sugar will not only help in maintaining weight but also add to your health and beauty.